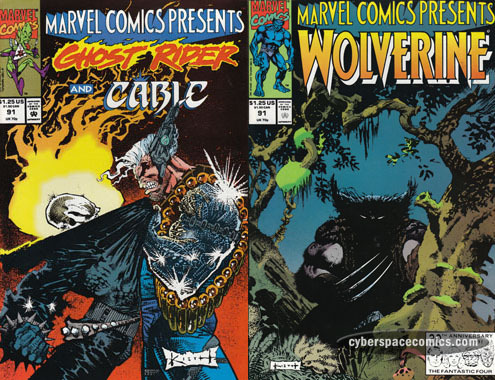 Marvel Comics Presents launched in 1988 as an ad-free anthology showcasing four eight-page features, stuffed inside a wrap-around cover. This guide will tell you everything you wanted to know about the series – and more! Tiger Tyger faces off against General Coy while Wolverine battles with Cyber. The Beast (and Jennifer Nyles, with him) discovers that Commander Courage has designs to turn notable powerful beings (such as Tony Stark and Victor Von Doom) into Were-Borgs under his control. Nyles is now convinced to aid the Beast in defeating Commander Courage and she reprograms the Super Apes to join them. Meanwhile, elsewhere in Courage’s base, the Constrictor rescues the Red Ghost from a group of Were-Borgs. Ghost Rider frees Cable and the two of them pursue the Grateful Undead in order to rescue the young girl who was taken by them. In their pursuit, they dare to cross a rickety bridge that gives way. The Grateful Undead seem to think it will drop our heroes into the very center of the Earth! Searching for his missing son, the Impossible Man ventures into Hell’s Kitchen, New York and interrupts a meeting between Daredevil and the Kingpin. The Wolverine story was a visual treat! The Beast feature got a little hoaky to suggest that this lame-o villain Commander Courage might actually have a chance of subjugating Marvel heavies like Iron Man and Doctor Doom. Ghost Rider/Cable is still quite bland and the Impossible Man short was fun in an all-ages kind of way. I wouldn’t consider it part of continuity, though. Tiger Tyger inquires about Cyber’s involvement in Logan’s past. He explains that he used to look up to the man in his youth until they had a falling out. 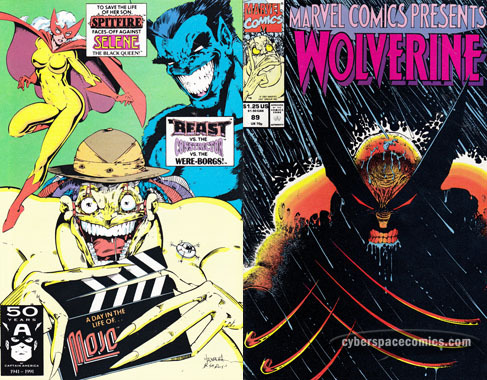 Cyber‘s one of the few people to have ever beaten Wolverine. Beaten so bad that Logan still can’t quite understand what happens – he recalls it all in nonsensical, symbolic dreams. Later that night, Tiger Tyger and General Coy both meet with Cyber but, he turns the deal around. He explains that intends to inject them with the drug (which will cause them to fight to the death) and then he’ll take the money they’ve brought and establish his own criminal empire in Madripoor. But, before he can take action – Logan shows up! While the Constrictor is battling the Super-Apes, the Beast has been caged by Jennifer Nyles and Commander Courage. Courage explains that he intends to capture the scientists attending the World Symposium on Mutant Research and then turn them into Were-Borgs. As the explanation draws to a close, the Beast’s sedative wears out so he’s able to escape (and take Nyles with him). Trekking through one of the many tunnels beneath Manhattan, Cable finds a young girl who’s running away from the Grateful Undead. They catch up to her and Cable while above-ground, Dan Ketch’s motorcycle calls to him – it senses that an innocent is in danger. 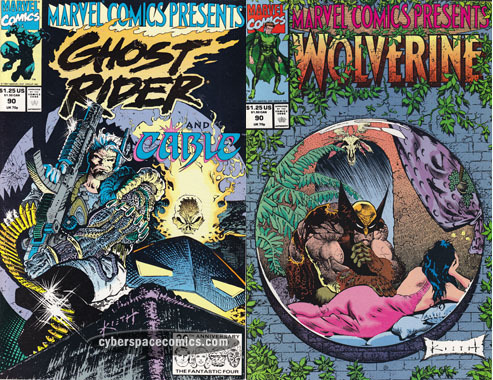 He transforms into Ghost Rider and burrows into the tunnels to find Cable has been captured. Nightmare tells the tale of an other-worldy orb that lands on Earth. Later, it hatches and grows into the alien creature called Fangu. The alien is eventually killed by humans but, unbeknownst to them, the creature intended to transform into a human form and reveal to them the secret of space and time exploration. It’s a strange sight to see Wolverine scared of a foe – that’s the case with Cyber, here. The Beast feature wasn’t quite as fun as last issue but the Nightmare short reminded me of those fun “Twilight Zone”-style Marvel Monster Mags from the 1950s. Finally, the new Cable/Ghost Rider team-up is off to an uninteresting and too-coincidental start. Note: This issue began the new MCP flip cover format. After her meeting with Cyber, Tiger Tyger sets out to find Wolverine – he’s gone missing ever since Cyber infected him with a hallucinagenic drug. As he comes to – she reveals that she did, in fact, make a deal with Cyber for the drug shipments – even though she really didn’t want to. Afterwards, we see Cyber making a deal with General Coy – Tiger Tyger is sure to disapprove when she finds out. The Beast seeks out the Constrictor and reveals that he thinks he was set up. After all, why would the Red Ghost hire him to kill the Beast? The Red Ghost is typically a Fantastic Four villain – and hasn’t encountered the Beast. Constrictor confirms that he never actually met with the Red Ghost – just that he was told that’s who was paying for the hit. So, the Beast convinces the Constrictor to join him in his quest for answers. The two of them then have to fight their way through a squad of Were-Borgs in to the Belgian Ministry of Defense (that’s where the Red Ghost is being kept – in ill health). After they dispatch those goons, they split up. The Beast finds Jennifer Nyles – and she pulls a gun on him! After receiving a second transfusion of blood from the original Human Torch (in Namor the Sub-Mariner #12), Spitfire‘s body has reverted biologically back 48 years! It’s a strange mutant power – to have regenerative blood that is triggered by the addition of synthetic blood. Blood that Selene (the Black Queen) wants! After all, Selene is an “energy vampire” – she has to kill others to maintain her youth. To that end, she’s kidnapped Spitfire‘s son in an effort to gain access to her body. She intends to vivisect the heroine in order to duplicate the process – a far simpler task than having to kill someone every time, I suppose. Naturally, Spitfire doesn’t want that to happen so she figures out a way to defeat Selene and rescue her son. Mojo’s media empire’s ratings have plummeted – a competitor has been luring away the audience with documentaries. Minor Domo suggests that they create a documentary to stay relevant (and, more importantly, in business). So, Mojor sets out to capture the X-Men in their natural habitat. Turns out, it’s pretty boring watching them live a normal day. When they get back, they realize that the camera was facing the wrong way – the X-Men were never even filmed. But, what it did capture saves the day – it becomes a hit show! Lots of good stuff here, folks. A Sam Kieth cover and very early work by Joe Madureira (and Dan Slott, too). I’m curious to see how this double-deal Cyber’s planning unfolds. The Beast story is really fun! I certainly did not see a Beast/Constrictor team-up coming … but I like it! Spitfire was this issue’s low point but the Mojo story was silly and fun (in that special Mojo-way). 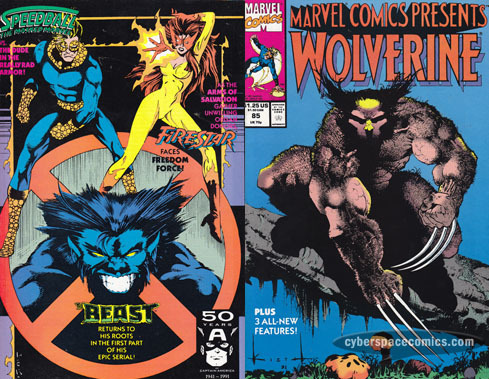 As Tyger Tiger and Cyber continue to negotiate the drug deal, Wolverine‘s healing factor works the hallucinagenic drug [that Cyber infect him with] out of his system. Jennifer Nyles is kidnapped by the Red Ghost’s Super Apes and Commander Courage arrests their leader. Later, the Beast breaks into Belgium’s Ministry of Defense to interrogate the Red Ghost – in an attempt to find out where the apes have taken his friend. Kragoff reveals that he doesn’t know where they’ve taken her – and, that the apes are no longer under his control! The Tarantula has been tracking down and killing perceived enemies of his nation of origin, Delvada. In response, Solo (“while he lives, terror dies”) tracks him down to put an end to his killing spree. But, he’s shocked the nation’s citizens come to the rescue of this terrorist! After the events of Secret Wars, Volcana is finding it hard to adjust to normal life, again. So, she sets out to be a super-heroine. Her first villain? The Wizard! Too bad she doesn’t realize he’s only intending to commit a minor theft. Everyone’s got to start somewhere, though … right? This issue we were treated to plenty of “dream action” from Sam Kieth – something he’s good at (it’s a chance to flex his creativity). I’m curious to see what the Super Apes are up to; they rarely act without being told what to do. The last two features were really digging at the bottom of the barrel but, I suppose even D-Listers need a chance to shine once in a while, too. Interestingly enough, Tarantula was more fun to read about than Solo. As for Volcana, it’s nice to see a full-figured super-heroine in action in the Marvel Universe [a rare sight, indeed]. After his meeting with General Coy, Cyber has approached Tyger Tiger to seek out a counter offer for the powerful hallucinogenic drug he intends to begin dealing in Madripor. Meanwhile, Logan is bleeding out from the wound Cyber gave him last issue. He’s lost so much blood that he’s started hallucinating. 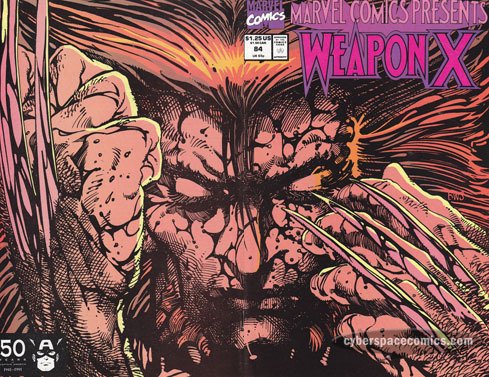 Perhaps Cyber infected Wolverine with the drug when he sliced open his gut last issue? 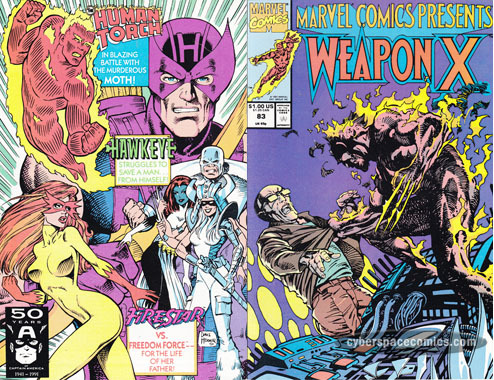 As Bart Jones begins to heal from his lung transplant operation, he’s unaware that his daughter, Firestar, has joined forces with Mystique against the Arms of Salvation. With Spiral’s help they defeat the the Arms and Mystique helps Firestar fake her death to keep them from coming back after her. The Beast has a long, drawn-out fight against the Constrictor. During the fight, he recognizes one of the hotel guests as Dr. Ivan Kragoff (you might know him better as the Red Ghost). The Beast takes note that Kragoff looks like he’s dying. Just before he’s defeated, the Constrictor reveals that the Red Ghost hired him to kill the Beast. Soon after, the Symposium on Mutant Research cocktail hour begins and the Beast is introduced to his old friend, Jennifer Nyles. That very moment, they’re attacked by the Red Ghost’s Super Apes. In Los Angeles, a gang is attacking senior citizens – and the Shroud wants to put a stop to it! Sam Kieth’s depiction of Tyger Tiger on page two is worth the price of admission, alone. Firestar’s story wraps up here and it’s plain to see this is intended as a prequel to New Warriors #1. I find it strange that they added in this plot point of faking her death. The Beast feature was a TON of fun – Beast is at the height of his quipping in his battle against the Constrictor. Shroud’s story was pretty basic – but I always enjoyed his story: becoming a crimelord in order to defeat crime. This short utilizes that plot point. Note: this is Joe Madureira’s first published work! Cyber is brought to meet with General Coy, personally. At Tyger Tiger‘s request, Wolverine is spying in on the meeting – although, Cyber catches on to him quickly and launches into an attack. When the two come face to face, it’s clear that they know each other – there’s a shared history, here. Cyber slices open Wolverine’s gut but Logan manages to escape. Firestar delivers Mystique to the Arms of Salvation in exchange for the donor lung for her father. Before she leaves, Cross invites the young mutant to join his organization. Meanwhile, Freedom Force decides to use their tracking device to locate their leader, Mystique. Back at the Arms of Salvation’s base, Firestar turns the offer down – in response, Cross has her electrocuted and knocked out. Before he can do any further damage, Freedom Force breaks into their base! Firestar comes to and tries to find her way out of the base but stumbles upon their organ harvesting program. Sick with guilt for bringing someone into their program, she frees Mystique – just in time, as they’re cornered by Cross. As the Beast flies to Brussels, he manages to recall fond memories of his youth spent with Jennifer Nyles. When he arrives at the hotel, he’s pleased to discover that his childhood friend is going to be the keynote speaker at the Symposium on Mutant Research. Soon after that revelation, he’s attacked by the Constrictor (it’s becoming painfully obvious that someone doesn’t want him going to that symposium, isn’t it?). Paladin has been hired to protect Metro Stadium from a bomb threat that’s been called in. Rather than pay the bomber the $20 million he was asking for, the owners of the stadium hired protection. Paladin stops the bomb from going off – AND he discovers the identity of the bomber! Not a very admirable way to end a battle in the Wolverine story – but it goes to show how powerful Cyber is. The forced alliance between Firestar and Mystique could prove to be an interesting twist. The artwork in the Beast’s feature is extremely eye-catching and Lobdell has an excellent knack for crafting the Beast’s dialogue. Paladin was the snoozer, this issue. Note: the inside back cover features a full-page Weapon X pin-up by Sam Kieth. I love his artwork! 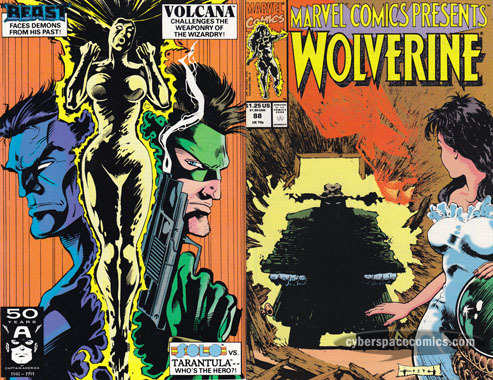 In Madripoor, Wolverine goes hunting with a wild wolf while a mysterious cloaked figure is traveling to that country. Later, Logan visits his old friend, Tyger Tiger, who explains that General Coy is involved in establishing new drug activity in the nation. The issue ends with General Coy’s representative welcoming the cloaked man, who is calling himself Cyber. In order to get a donor lung for her father, Firestar is forced to fight Freedom Force (Mystique, the Blob & Pyro). If she can capture Mystique, her father will get the lung from the Arms of Salvation. While the battle rages, the Arms of Salvation attack an innocent family in order to acquire a lung … from another living, breathing man! They kidnap the man and another girl from the house named Meg (a friend of Firestar’s). The Beast reflects back on his first hour as an X-Man with Ship (X-Factor’s sentient headquarters). He went on a rampage – his anger directed at the Professor because Xavier had erased the memory of Henry McCoy from one of Hank’s childhood friends (in order to protect his new life as an X-Man), named Jennifer. Meanwhile, in Brussels, a killer mutant is on the loose – Lt. Commander Courage considers timing inconvenient since the city will soon be holding the first world symposium on mutant research. Back in the U.S.A., the Beast’s mail carrier is attacked while trying to deliver the invitation to the symposium. The Beast defeats the assailant … but who sent him to stop the invitation from reaching its target? At Hammond Labs (the place where Speedball got his powers), Doc Benson introduced Robbie Baldwin to Edgar Marlopolis, an exchange student from the island of Trepica. But, there’s more to Edgar than initially believed – he steals Benson’s experimental battle armor with plans of ruling the world. Luckily for the world, Speedball is there to defeat the “Dude in the Really Rad Armor”. Here’s another important issue for the Marvel Universe (albeit, mostly for Wolverine’s history): it’s the first appearance of Cyber. It’s also the first (of many!) Sam Kieth covers for this series. As a Kieth fan, I’m psyched to start digging into these covers – and the interior art, as well! The first part of the Wolverine feature laid some neat groundwork. Firestar’s story moved along into a big battle issue. 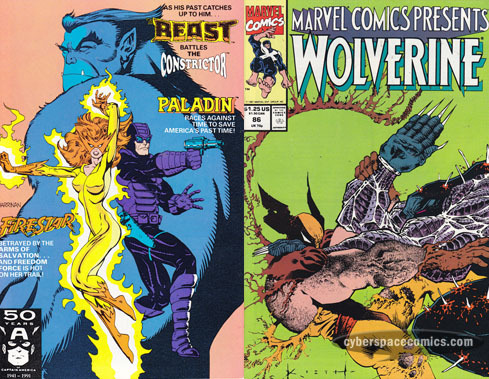 The Beast story features an interesting look at a never revealed part of early X-History and the big stinker was the Speedball short. Weapon X tosses the corpse of the Professor into the fission gate and then breaks out of the facility. In the snowy wilderness he comes face to face with a Siberian tiger and it’s clear to us (although not Logan), that he’s still being monitored. Watched by three voices: Hines, Cornelius and the Professor. But … aren’t they already dead or unconscious? Well, not quite. It turns out that those memories were implanted into his psyche. The story ends with Weapon X finding the three of them holed up in another monitoring room. And, he doesn’t look too pleased with the deception he’s just uncovered. The mysterious Arms of Salvation (Cross & Fitch) have promised Firestar a donor lung for her father … in exchange for a “small service”. The service in question is the capture of Mystique, the leader of Freedom Force. 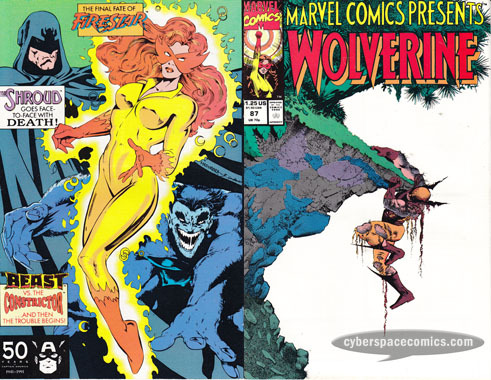 So, Firestar seeks out the government-sanctioned mutant-hunters for round two! For more than fifteen years, the mysteries surrounding Wolverine’s earlier years were in high demand. The Weapon X story that concluded in this issue was intended to answer some of those questions but it certainly brought up even more questions. Questions like, who was the Professor working for? To be honest, it’s not all that informative of a story nor is it all that entertaining (there’s certainly very little characterization for Logan). But, for its time, it was a very important part of Wolverine’s early history. As for Firestar’s feature this issue, it was quite uneventful. The Professor opens the fission gate and unleashes a flaming discharge of 240,000 mega-therms upon Weapon X. But, that’s not enough to stop Logan. Even burnt to a crisp, Weapon X still pursues his prey: the Professor. And, after coming so close multiple times before, Logan finally nails his target with three claws through the head. Before she can be captured, Firestar bursts out of her house with her father. Before the rest of Freedom Force can catch up, Spiral runs her father through with a sword. And, after Freedom Force launches their attack on her, Firestar manages to escape with enough time to bring her father to the hospital. It seems that Mystique wanted to recruit her into the team but the difficulty with her capture may have changed her mind. Meanwhile, two other figures (Cross and Fitch) decide that they want to recruit Mystique for their own nefarious cause. A washed up boxer named Carmen “the Rocker” Jakarter decides life isn’t worth living anymore. Can Hawkeye reach him in time to change his mind? Two goons inform a new super-villainness called the Moth that their boss will pay her one million dollars to capture the Human Torch. After she manages to achieve that goal, she discovers that there is no boss willing to pay the money. The goons intended to kill her and sell the Torch off to the highest bidder. Before they get to her, she discovers their intent and teams up with the Human Torch to defeat them. After flirting with the concept for the past few issues, the Professor meets his death at the hands of Weapon X. The Firestar feature continues to have some high stakes with the life of her father at risk. Hawkeye’s story was depressing with little room for inspiration and the Human Torch story had a fun little twist in the middle. At the Professor‘s urging, Doctor Abraham Cornelius riddles Weapon X with bullets. While Weapon X fights back, seemingly killing the doctor – the Professor runs off to the reactor with Miss Hines. He intends to lure Weapon X into the exhaust-pit so that it will incinerate him. The villainous Professor grabs Hines and tosses her into the pit as bait. As Weapon X is lured in by her screams, the fission-gate is opened and the purge sequence begun. Firestar‘s code name, costume and training were all given to her by the White Queen (Emma Frost) but she later rebelled against her teacher. Emma swore that she wouldn’t go after Firestar herself … but that doesn’t mean she can’t have her revenge in other ways. With the press of a button, Emma releases all of her information on Firestar to Freedom Force (the government’s private mutant hunters). Part of the group (Mystique, Spiral and Avalance) breaks into Firestar’s house, placing her under arrest. Tony Stark has been called to Kuau’i by his friend Carl. Carl’s brought all of his Stark equipment to the island in order to get started on building a new resort … but he just can’t get the equipment working. Tony is baffled by the equipment; they appear to function normally until they’re actually put to work. Later that night, at Carl’s residence, Iron Man discovers an ancient skull that was removed from the construction site as it flies (under its own power) back to where it came from. As Iron Man approaches the skull, his power cuts out! He then experiences a vision (or a head trip?!) as Hawaiian spirits explain how their land was taken from them in 1778. The next day, moved by the experience, Tony Stark the land from Carl and decides to turn it into a cultural museum, instead. After the events of Power Man and Iron Fist #125, Luke Cage was accused of killing Daniel Rand. Now, Power Man is in hiding in Chicago but, this hero can’t stay hidden long when wrongs are being done. So, he risks his freedom by stepping out into the spotlight to protect some tenement dwellers from their life-draining super, Victor. The Professor continues to stoop to all-new depths to protect his own hide. The Firestar story is off to an interesting and action-packed beginning. 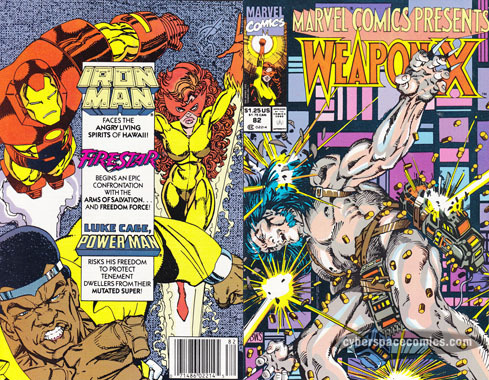 Iron Man’s feature was a change of pace from most of his other stories – I don’t really know how well the spirit-world works with Iron Man stories and this doesn’t do much to change my mind in favor of them. Power Man’s short offered a quick afterword to his long-running series (which was cancelled five years prior).